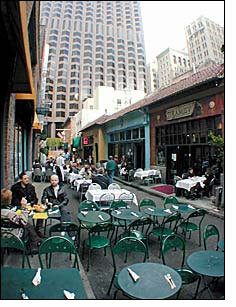 As they say, “If San Francisco had a French quarter, Belden Place would be it.” It’s an intimate, human-scaled alley lined with cafes, tucked away between Bush and Pine, Kearny and Montgomery streets in the Financial District. The entire pedestrian-only street (paseo) is one elongated dining room, and a larger version of the ones in Sienna, Spain. While they do celebrate Bastille Day in the alley, the day-day culinary experience is anything but exclusively French. On any given day, one can enjoy Moroccan kebabs, Spanish pan of paella, Italian homemade pasta, fresh seafood, as well as traditional French crepes, casseroles and seared meats.